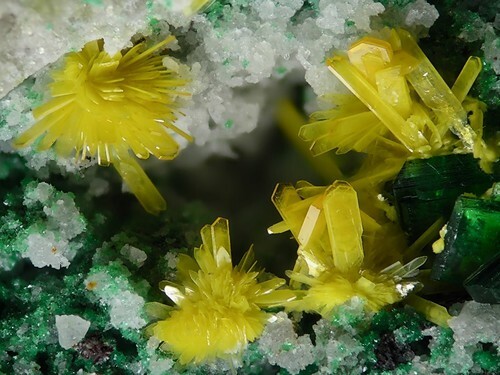 Kasolite: Mineral information, data and localities. Possibly the Pb analogue of unnamed phase 'UM1956-02-SiO:CaHU'. The only accepted Pb-U silicate mineral. Chemically similar to 'orlite'. Torbernite 66 photos of Kasolite associated with Torbernite on mindat.org. Malachite 37 photos of Kasolite associated with Malachite on mindat.org. Wulfenite 25 photos of Kasolite associated with Wulfenite on mindat.org. Cuprosklodowskite 19 photos of Kasolite associated with Cuprosklodowskite on mindat.org. Quartz 14 photos of Kasolite associated with Quartz on mindat.org. Curite 14 photos of Kasolite associated with Curite on mindat.org. Uraninite 9 photos of Kasolite associated with Uraninite on mindat.org. Uranophane 7 photos of Kasolite associated with Uranophane on mindat.org. Metatorbernite 7 photos of Kasolite associated with Metatorbernite on mindat.org. Vandenbrandeite 6 photos of Kasolite associated with Vandenbrandeite on mindat.org. Schoep, A. (1921) Sur la kasolite, nouveau minéral radioactif. Comptes Rendus de l‘Académie des Sciences Série II. : 173: 1476-1477. Hogarth, D.D. (1951) Studies of radioactive compounds: II—meta-zeunerite, uranophane, kasolite, and cuprosklodowskite in Canada. American Mineralogist: 36: 411-414. 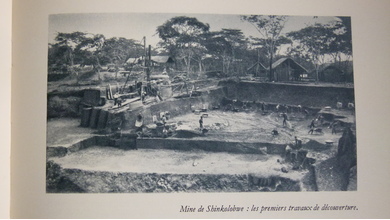 Huynen, A.M., Piret-Meunier, J., Van Meerssche, M. (1963) Structure de la kasolite. Académie Royale de Belgique, Classe des Sciences: 49: 192-201. Mokeeva, V.I. (1965) The crystal structure of kasolite. Soviet Physics - Crystallography: 9: 621-622. Zapiski Vserossiyskogo Mineralogicheskogo Obshchestva (1972): 101: 27. Rosenzweig, A., Ryan, R.R. (1977) Kasolite, Pb(UO2)(SiO4).H2O. Crystal Structure Communications: 6: 617-621. Stohl, F.V., Smith, D.K. 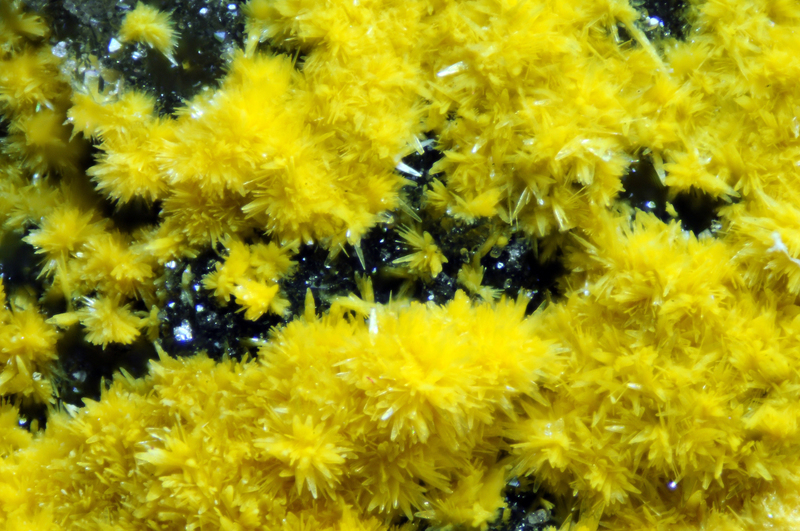 (1981) The crystal chemistry of the uranyl silicate minerals. American Mineralogist: 66: 615-625. Vochten, R., Blaton, N., Peeters, O., Van Springel, K., Van Haverbeke, L. (1997) A new method of synthesis of boltwoodite and of formation of sodium boltwoodite, uranophane, sklodowskite and kasolite from boltwoodite. The Canadian Mineralogist: 35: 735-741. Frost, R.L., Cejka, J., Weier, M.L., Martens, W. (2006) Molecular structure of the uranyl silicates - a Raman spectroscopic study. Journal of Raman Spectroscopy: 37: 538-551. Plášil, J., Sejkora, J., Cejka, J., Škoda, R., Goliáš, V. (2009) Supergene mineralization of the Medvedín uranium deposit, Krkonoše Mountains, Czech Republic. Journal of Geosciences: 54: 15-56. K. Fejfarová, M. Dušek, J. Plášil, J. Čejka, J. Sejkora, R. Škoda (2013) Reinvestigation of the crystal structure of kasolite, Pb[(UO2)(SiO4)](H2O), an important alteration product of uraninite, UO2+x. J. Nucl. Mater. : 434: 461-467. Angela Giblin (2004) Alligator Rivers Uranium deposits (Koongarra, Nabarlek and Ranger One) Northern Territory. CRC LEME; Isobe, H., Murakami, T., & Ewing, R. C. (1992). Alteration of uranium minerals in the Koongarra deposit, Australia: Unweathered zone. Journal of Nuclear Materials, 190, 174-187. L. I. Cowan (1962): Cuprosklodowskite, kasolite and schoepite from Great Bear Lake, Northwest Territories, Canada. Can. Mineral. 7, 331-332. Ref. : Geological Survey of Canada Miscellaneous Report 39.; Satterly, J. (1977) A Catalogue of the Ontario Localities Represented by the Mineral Collection of the Royal Ontario Museum; Ontario Geological Survey Miscellaneous Paper MP70,464p. J. Plásil, J. Cejka, J. Sejkora, P. Skácha, V. Goliás, P. Jarka, F. Laufek, J. Jehlicka, I. Nemec, and L. Strnad (2010): Widenmannite, a rare uranyl lead carbonate: occurrence, formation and characterization. Mineralogical Magazine 74, 97-110. Comptes rendu de l’Académie des sciences de Paris (1922): 173, 1476-1477; Palache, C., Berman, H., & Frondel, C. (1951), The System of Mineralogy of James Dwight Dana and Edward Salisbury Dana, Yale University 1837-1892, Volume II: 914. Raslan, M. F., Ali, M. A., & El-Feky, M. G. (2010). Mineralogy and radioactivity of pegmatites from South Wadi Khuda area, Eastern Desert, Egypt. Chinese Journal of Geochemistry, 29(4), 343-354. Saini, S. N.; Rahman, M.; Roy, M. K.; Singh, G. (2004): Uranium mineralisation in Lower Proterozoic basal quartzite of Putholi-Hamirgarh basin, Chittorgarh district, Rajasthan. Exploration and Research for Atomic Minerals 15, 147-153. Caboni F., Lecca G.C., Marengo A., Bittarello E., Brizio P. and Ciriotti M.E. (2019): Tre nuovi minerali per Arcu su Linnarbu, Capoterra - Sardegna. Micro vol. 17, 1, pagg. 19-27.; Caboni, F., Lecca, G., Marengo, A., Bittarello, E., Brizio, P., Ciriotti, M.E. (2019): Tre nuovi minerali per Arcu su Linnarbu, Capoterra - Sardegna. Micro, 17, 19-27 (in Italian with abstracts in English, French and German). Lyalina, L.M., Selivanova, E.A., Savchenko, Ye.E., Zozulya, D.R., Kadyrova, G.I. 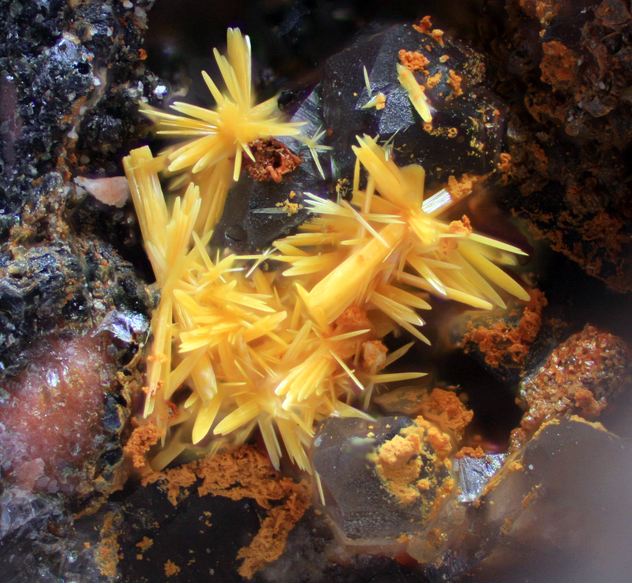 (2014): Minerals of the gadolinite-(Y)–hingganite-(Y) series in the alkali granite pegmatites of the Kola Peninsula. Geology of Ore Deposits, 56, 675-684. Stalder, H. A., Wagner, A., Graeser, S. and Stuker, P. (1998): "Mineralienlexikon der Schweiz", Wepf (Basel), p. 237.
von Backstrom, J. W. (1974). Other uranium deposit. In IAEA Symposium on the formation of uranium ore deposits. Athens, Greece (pp. 605-624). Galbraith, F.W. & D.J. Brennan (1959), Minerals of Arizona: 41, 112. Anthony, J.W., et al (1995), Mineralogy of Arizona, 3rd.ed. : 266.
ⓘ Iris and Natalia claims ? MRDS database Dep. ID file #10095028, MRDS ID #M000219. ⓘ Lena No. 1 - 11 claims ? Granger, H.C. & R.B. Raup (1962), Reconnaissance study of uranium deposits in Arizona, USGS Bull. 1147-A: A31-A34. Anthony, J.W., et al (1995), Mineralogy of Arizona, 3rd.ed. : 296; Galbraith, F.W. & D.J. Brennan (1959), Minerals of AZ: 77. Anthony, J.W., et al (1995), Mineralogy of Arizona, 3rd.ed. : 124, 266, 408; Robinson, R.L. (1954), Duranium claims Santa Cruz Co., AZ, US Atomic Energy Comm. Preliminary Recon. Rept. A-P-285; Shawe, D.R. (1966), AZ-NM and NV-UT beryllium belts, USGS PP 550-C: 206-213. ‡Ref. : Anthony, J.W., et al (1995), Mineralogy of Arizona, 3rd.ed. : 266. Frondel, C. (1958), Systematic Mineralogy of uranium and thorium, USGS Bull. 1064: 315; Grant, Raymond W., Richard A. Bideaux & Sidney A. Williams (2006), Minerals Added to the Arizona List 1995 to 2005: 8. Species confirmed by Dr. Robert Housley. (Personal communication March 2019). Small occurrence likely at the 500' level with two specimens from Inventory of Ralph Merrill of Minerals Unlimited circa 1970's-1980's. (Personal communication from Sharon Cisneros, Mineralogical Research Co). More recent sample collected by Daniel Evanich, May 2016 at the 500' level. Murdoch, Joseph & Robert W. Webb (1966), Minerals of California, Centennial Volume (1866-1966): California Division Mines & Geology Bulletin 189: 235.
ⓘ R. H. D. Mine (St. Anthony mine) ? ⓘ Central City; Cherokee; Carroll; Woodmire; Rara Avis ?